Do you love salvage stores? Perhaps even "commercial fixture" salvage stores? You're about to have another reason to like them. Awesome trellis! There's not much to say about the images here. If you cannot resist this stuff, it's called "grid panel," and you can find it online, though I dare say shipping would be gruesome. It is steel grid fashioned from rods about a quarter of an inch thick. The openings in the grid are approximately 2 inches square. It generally comes in either two or four-foot wide panels. Lengths vary. 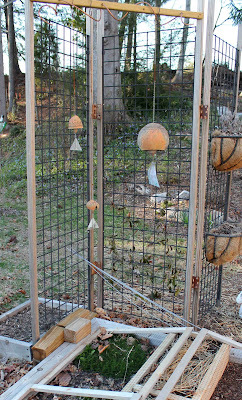 In the top photo, I've suspended a small (two feet wide) panel with cup hooks from a cedar frame that is screwed to the sides of the raised beds. 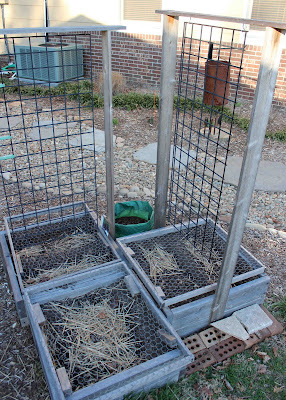 The beds are planted with asparagus this year (and being perennial, for the rest of their life or mine, whichever comes first), so I'm not sure how trellis is necessary... may let some lazy susan vine crawl up it! The final image also makes use of 2'x6' panels. All of the panels have a double rod structure on the sides. That allowed me to run a screw between them and into some treated 2"x2" lumber. I did three separate panels this way, then hinged them with some old door hinges. Our wind here can be frightful, though, so I stood the "screen" up to figure out where the feet of the 2"x2"s would go, dug holes, dropped in PVC pipe, and then dropped the legs of the panels into the PVC holes. It CANNOT blow over. Now. After it did before I dug holes in the ground. Except maybe in a tornado or some other horrific event that I don't want to think about. 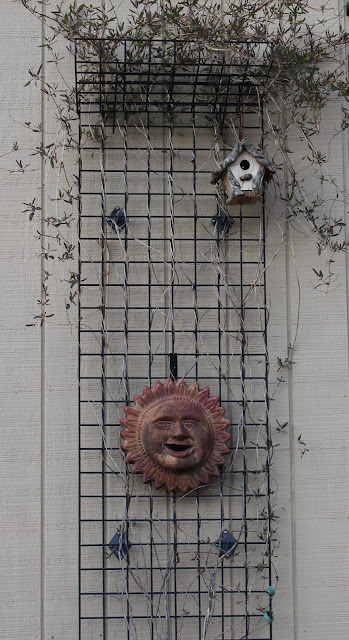 These panels are used in any number of commercial/retail stores for displaying merchandise and they have several different "attachments" that can be useful for the garden. On the back side of the shed we have a 4'x4' grid panel (also mounted with the stand-off wall brackets) which is used to hang a number of tools--and also has some shelving. It's strong stuff, and as commercial fixtures go, it's better looking than many. Also lasts longer. Comes in chrome (don't you go there! ), black and I think I remember white. The paint used is not a UV tolerant variety, so plan on not caring or updating with some better quality paint!